Weighing In | Tennessee Aircraft Services, Inc.
There’s always something very tempting about weigh scales. If you know you’re losing weight, then there’s the excitement in confirming the loss. If you’re gaining weight, as I am, there’s the hope that it’s not piling on as fast as you think. Stepping on that scale is the only way to know. If you are sure the news will be bad, then you might be far less inclined to make that move onto the scale. When it comes to weighing your airplane, let me save you some trouble; the news will be bad. When your plane came off the assembly line and was weighed, or more likely the weight was calculated, everything was perfect. There wasn’t 1/2 inch thick layer of gunk in the belly, and it didn’t have the newer and heavier interior it now has. There wasn’t 40+ years of old avionics wiring that no one has bothered to remove. As equipment is added, the new weights are typically calculated. My experience is that installed weights are low, and errors are usually on the light side as well. When a plane is set up on the scales, none of these accumulated omissions and miscalculations can hide. If you insist on pursuing this path of knowledge, being fully informed of the probable outcome, let’s at least explore some of the process. We cannot just roll the plane up on some scales and total the numbers for a weight. For better or for worse, there’s much more involved to get the aircraft weighed properly. As with many jobs, getting started is half the battle. In the case of weighing a Cessna, just finding the instructions can be an event. Since most of us consider weighing a plane to be a maintenance function, the place to look would likely be the Cessna maintenance manual. Our subject 1964 182G is included in the Model 100 Series (1963­1968) Maintenance Manual (rev 1), so I start my search there. I scour through the manual from front to back and find very few references to the aircraft weight or balance and no instructions for the proper method to weigh the plane. Maintenance Manual section 1 General Description states the Design Gross Weight is 2800 pounds and has a chart showing the station numbers of the bulkheads. No instructions. Maintenance Manual section 2 for Ground Handling, Servicing, Lubrication and Inspection does have paragraph 2­11 that explains how to level the plane. For lateral leveling the top door sills are the reference. Of course, working around the upholstery on the door sills to be sure solid aluminum points are found is necessary. On this model Cessna the longitudinal leveling is done by setting a level on top of the tail cone between the aft window and the vertical fin. The only other mention of weighing or balancing is in Section 19 for Structural Repair. This reference only has to do with the balancing procedure for the flight controls and not much help when weighing our plane.Another source for weight and balance information is the Pilot’s Operating Handbook. Due to the age of our sample airplane there is no POH. This vintage plane could have an Owners Manual with the needed information, but it’s not FAA required. Unfortunately, this plane does not have an owners manual either. The search continues. A simple level set on top of the empenage as called for by Cessna. The newer 182 series are very similar to the sample, and the weighing procedure should be nearly the same. A look through a 1982 POH is enlightening but calls for using leveling screws on the left side of the empennage, which the sample plane doesn’t have. As a last resort, the Cessna factory is called to find a formal printed procedure for weighing this plane. As usual, Cessna does not disappoint and emails a PDF copy of the two page instructions for our specific model 182. As with most work, the devil is in the details. 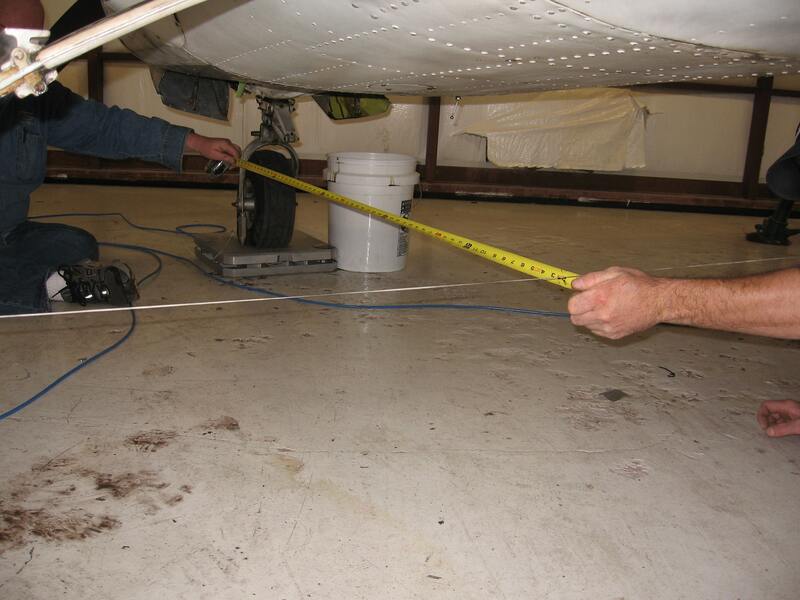 As you can see in the picture of the weighing procedure, Cessna has some specific requirements that must be followed. Preparation details include the following: inflate the tires, drain the fuel (at the wing sumps), drain the oil, crew seats slide all the way forward, seat backs vertical, flaps retracted, and controls in their neutral position, all needed to get repeatable results. The leveling instructions are a bit sparse but make good sense when combined with the information found in the maintenance manual. At first it might seem odd that the distance from the datum to the nose axle and main gear axle stations is not included in the instructions. This is due to the slight variations in the position of the main gear axles caused by the gear leg mounting. Also, the nose strut is not parallel to the firewall or perpendicular to the level line. As the nose strut extends or compresses, its longitudinal distance from the datum changes. As a result of these two details, the position of the axles as weighing points must be determined each time a plane is weighed. Nose wheel on the scale, strut fully compressed, tire slightly deflated and the plumbbob hanging from the forward face of the firewall for zero datum reference. To get the plane level, the nose of the plane needs to be as low as possible. To do this the nose strut is fully collapsed and a couple of 2”x 8” boards are placed under the main tires. The pressure in the nose tire is then adjusted to tweak the leveling bubble to center. Next a plumb­bob is attached to the firewall for measuring reference to datum. A string is pulled between the main wheels centered on the axles for the arm of the mains. Distance between main gear axles and the datum is measured along the airplane’s centerline. The nose axle is then measured either from the datum or from the center of main gear axle line. These being the weighing points, it is very important to have them located accurately. Measuring from the datum plumbob to the string pulled between the main gear axle centers. Note: For the 182 series the 0.0” datum is the forward face of the firewall. When the plane is level, the firewall is generally vertical. Positions forward of the datum are considered negative, and those aft are positive. Some airplanes might use a seemingly arbitrary point in space forward of the propeller, making all the positions positive. One must ensure the proper location of the reference datum is located. 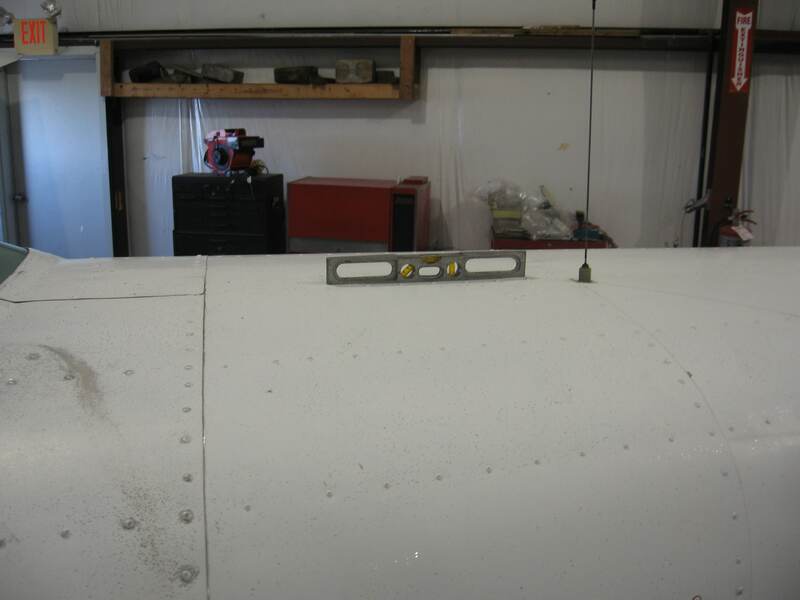 Our planes were delivered with a list of all the required and optional equipment the factory installed. As the plane goes through life, the list should be revised or supplemented as needed to keep it current. The list includes everything from the make and model of the propeller to the various avionics items to wheel fairing to the tow bar. Yep, even the tow bar might be on the list and for weighing, the tow bar would have a specific location. Some planes were delivered with curtains and if on the equipment list, they should be installed for the weighing too. To get that warm fuzzy feeling inside you’ll want to do a few things to prepare the plane for this weighing event. A detailed inspection of all the nooks and crannies to remove all the birds nests and dirt dobber nests is a good start. Then remove all the floor access panels and scrape out all those layers of oil, hydraulic fluid, cola, dirt, M&Ms, grease and such that have accumulated over the last few decades and clear the drain holes in the belly skins. Note: You really shouldn’t find a dirty interior belly because it must be clean for your IA to inspect during every annual. If you do find such a layer of yuk, then you should wonder how all that structure is being inspected every year when it can’t be seen. Before you suggest it, NO, that oily goo does not inhibit corrosion. It actually promotes it since it’s full of combustion acids and moisture. It needs to be clean and stay clean. Now would be a good time to remove all the remnants of old avionics installations, too. There may be wire bundles and individual wires that start nowhere and go nowhere. You may find mounting trays that are empty. Check all those unlabeled circuit breakers, fuses, and switches to see if they actually still do anything. For airplanes flown under FAA regulations Part 91 there is no requirement to routinely weigh the plane. There is also no requirement from Cessna to weigh the plane, although it is recommended in some of the newer service manuals. Even with no requirement about WHEN to perform this check, the FAA does regulate HOW to perform the work. According to FAR 43.13, if the aircraft manufacturer has instructions for a particular maintenance function, then that procedure must be followed (FAR 43.13). There are many reasons to weigh an airplane, some valid but most not. There are some compelling arguments from various camps against weighing and finding out the truth. It’s definitely your call. There’s an old saying, “If you can pack it in and get the doors closed, a 182 will carry it”. Such a cavalier attitude towards safety has gotten many people in trouble over the years. If you’re the type to weigh your plane to find the truth, you already know the saying isn’t true.